FA: Ed Barry, Dave Hitchcock, July 1980. With great climbing up steep cracks and face, Third World is a quality but rarely climbed route. With steep, well-protected crux cracks, and with the replacement of the old ¼” bolts in October 2006, the route is bound for renewed popularity. The first pitch is an excellent, varied, and challenging 5.10a, and is definitely worth climbing as a stand-alone pitch if the 5.11 crux is too difficult. The protection for the last hard moves on the first pitch is a recently reset old piton which should be backed up as best possible in the slightly hollow finger crack below. Beware of large loose blocks on top of the Pitch 2. Walk left on the ledge and rap Cyclone with one 60-m rope (watch rope ends! 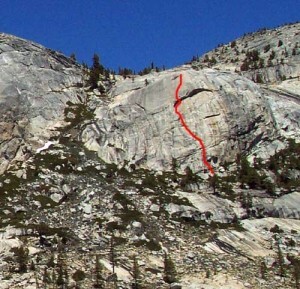 ), or continue to the top and hike off left. Which SuperTopo guidebooks include a topo for Third World?